For decades, children grew up reading famed author and illustrator Steven Kellogg’s stories about cows, unicorns and dogs. Kellogg lived and wrote in Sandy Hook for 35 years, raising his children in a place that he said gave people a good quality of life and a feeling of safety. Kellogg moved from Sandy Hook 10 years ago, but the events December 14, 2012, affected him greatly, sending him, like so many others, into a depression. He lost what he called his optimism to do what he had done for so many years. Fortunately, Kellogg shared an agent with Patricia MacLachlan, an award-winning children’s author. MacLachlan was asked to write a children’s book with a Sandy Hook theme. When she heard that Kellogg was struggling, she agreed to collaborate with him on the unique project. The book made them both busy with a purpose. The pair worked quickly from separate locations. The result is an innocent and inspiring children’s book called Snowflakes Fall. Since the book is geared towards children between the ages of 3 and 7, the author chose to write in metaphors. 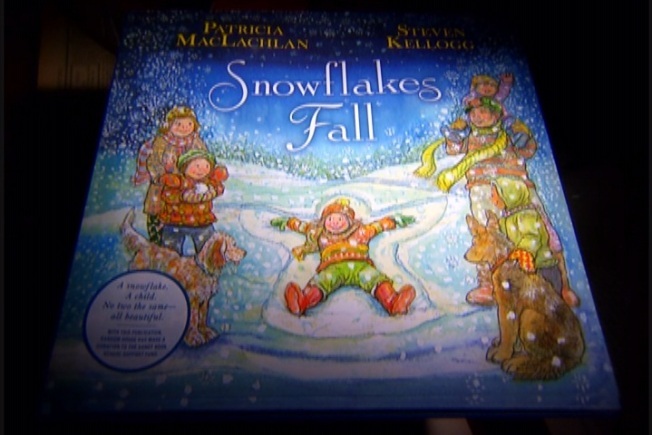 The book shows children making snow angels. Snow is the book’s theme, since snowflakes became a symbol of tribute to the Sandy Hook shootings. One section points out that no two snowflakes are the same, a reference to the children who lost their lives in the 2012 tragedy. “A lot of emotion putting this book together," Kellog said. "It was the story of a place that I loved that had suffered and I wanted to help to heal it." MacLachlan did not want the children who lost their lives to be forgotten. She wanted to write about how joyful childhood can be, and also the changing seasons that are part of life. “Then when the snow goes as sometimes things leave, the flowers will come again when the rain comes. It’s about memory and renewal,” MacLachlan said. Kellogg says he found the process of illustrating the book therapeutic and uplifting, restoring his outlook on life. Random House, which published the book, made a donation to the Sandy Hook School Support Fund and donated 25,000 copies of Snowflakes Fall to children in need.